Slots in resuturant and press the seam. The inner sections of the allowances on the slot and obcutek lower sides of the slot overcast and zastrugivajut on the machine seam itagiba the open cut. Allowances for machining slots, located in razotajiem seam, are bent on the front side on the planned line, primetyvajut allowance for the slot by the line of bend of the bottom and pritachivajut (Fig. 541). The corners turn out, straighten the edges of the slots and spawn. The inner sections of the slots pritachivajut to the allowance for bending the bottom (Fig. 542). The edges of the slots prostrachivajut finishing line. The upper side vents located press the seam, treated as described above.On the lower side of the slots primetyvajut obtachku on the side and bending the bottom and grind (Fig. 543). The seam allowance in the corner cut, leaving only 0.15-0.2 cm, angles of turn, straighten, spawn, and then priorivet. Parts with finished edges for splines folded, right sides inside, to equalize the inner edge of the splines and fix the top edge with double stitching across the width of the seam allowance, at the same time grinding off the weld, where is located the slot. Slot at the upper end may be secured by machine stitching from the front side. The inner edge of the seam allowance of the upper side and the inner edge of the piping lower side slots primetyvajut and pritachivajut to the allowance for hemming the bottom. The slot and the suture priorivet. line. Cut the bottom of the inside bends of 0.7-1 cm and zametyvayut. Hem hem stitches blind stitch manually hidden. Sometimes the bottom of the product zastrugivajut on the machine. Line have a distance of 0.1-0.2 cm from the bent edge (Fig, 544). In the products of legkopolirujushchiesja tissue slice bottom is recommended to turn over (Fig. 544 6). For this lining or silk fabric cut crosswise grain lines or at an angle of 45' strip in width of 2-3 cm to the base material color and put it on the bottom of the product front side to the front.Slices of the product and equalize the strips and sew seam with the width 0,3-0,5 cm, holding the strip in the tense form, then a strip of round cut of the bottom and the front side lay a second line to the seam primaqiune strips. The processed edge of the bottom products primetyvajut and hand sew hidden stitches. 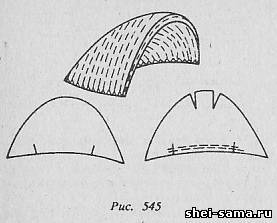 In products through the fastener hem and the bottom edge of podborov sutured together (Fig. 544) from the inner edge of the left podborta to the inner edge of the right podborta. Then podborta laid on the underside of the items and attach them to the product line of the inner edge by the amount of the allowance for bending the bottom. Handle the bottom of the blouse, jacket, jackets stitched belt. Belt bend across the middle and fold face inside. Grind off the ends of the belt seam width 0.7-1 cm Seam cut, leaving a seam allowance of 0.2 cm Waist twist at the front side, straighten the seam. If the belt clasp, the processing similar to the processing of a stitched cuffs in the sleeves. In the side seam of a jacket or blouse may be cut to continue the seam. It is treated as a clasp located on the continuation of the seam of the sleeve. The lower part of the belt is folded with the product, right sides inside, primetyvajut, equating sections, and pritachivajut seam width 0.7-1 cm.The belt is folded, the seam is guided to the belt. Raw cut belt buckle by 0.5-0.7 cm, primetyvajut and scribbled at a distance of 0.1-0.2 cm from the bent edge to bent edge of a closed line of protecive belt (Fig. 544 g). In the products of wool fabric, raw cut belt is allowed to bend and hem stitches blind stitch manually hidden (Fig. 544 d). , the Product inside out and iron the sleeves first, then all product and last of all the collar. Side, collar, belt, cuffs, and hem, and iron the front side using wet protohellenic. Buttons serve not only to fasten the product, but also for its decoration. If the loop is made on a material having a substantial thickness of (0.2-0.5 cm), between button and item should be the so-called leg height 0.3-0.6 cm, formed by loose stitches, fastening the button with the product. Leg wrap 4-6 turns of thread, the end of which is fixed loop-like stitches. Finishing, underwear and button eyelet sew close to the product. Below the hooks and loops was resilient, they need a little push in place of a split wire. The hooks are sewn in three places for each ear and at the bend - 3-4 3-4 securing stitches and fastening; loop in three places; behind each ear and in front of ears 3-4 3-4 stitches to secure and perpetuate. Buttons consist of two metal parts: the head and pads with spring. Sewn 4-5 stitches in each hole. In the products of the delicate tissues under the buttons on the underside are laid pieces of cotton fabric. Top shoulder pads for easy wear handle, ispolzue for the upper and lower parts of the main or lining material, and the strip of wool. To create the shoulder pads the more rigid forms possible to use batting. The outer edge detail shoulder pads cut out is longer than the outer edge of the lower by the amount of Assembly that is needed to create the form. On the top part of the lining from the internal trimming of the cut has two Darts (Fig. 545). The marked area of the outer cut of the top part of the lining gather on the Assembly. sew Darts and outer sections of the upper and lower parts of the shoulder pads. Seam piecing together sections rautureau, the seam stitching tucks iron. Between sacanime details lay a layer of wool of the desired thickness.The outer edge of the shoulder pads made thicker, gradually diminishing to the inner edges. Upper detail lining round the roller formed at the outer edge, lay the first row of vystavovania, then the next. Wystawianie produce weak loose hand stitches, pulling the lower part of the shoulder pads to create the form. Sections of the upper and lower parts of the shoulder pads overcast at the same time, i.e. both the cut together. The top of the shoulder pad slightly priorivet (without moisture) from the lower parts in two stages, first pritoria one half of the lining, then another. The connection of the upper shoulder pads with a seam of vrachevanie sleeve in armhole produce, paving the needle a shoulder pad (not through).